Jutting out at the elbow of the peninsula, Chatham is slightly removed from much of the bustle of Cape Cod. Surrounded on three sides by water, with the Atlantic Ocean to the east, Nantucket Sound to the south, and Pleasant Bay to the north, Chatham’s only neighbor on land is the fellow Lower Cape town of Harwich. The town has several ocean, bay, and freshwater pond beaches, the most popular of which is Chatham Lighthouse Beach (home to an active Coast Guard station lighthouse). This is one of the loveliest ocean beaches on the Cape, but the cold waters here are also quite treacherous due to strong currents, and no life guards are on duty (in fact, there are no bathrooms or parking either), yet it is this wild beauty that attracts many visitors and residents alike. The town’s bay and harbor beaches tend to be more popular for swimming, especially for families with children, as the waters are warmer and calmer. Not far from Chatham Lighthouse Beach is the town’s fish pier, a great spot not only for taking in picturesque Catham Harbor, but also for getting a front and center view of the fishermen as they return from the ocean and unload the day’s catch from their boats (and the seals that frequently follow them). Nearby, the quaint town center is pedestrian friendly, with restaurants, cafes, galleries, antiques shops, boutiques, and historic buildings all within easy walking distance of each other. Don’t miss the free summer evening concerts on Fridays in the town center’s Kate Gould Park, not to mention Chatham’s annual Maritime Festival (May) and First Night Celebration (New Year's Eve). 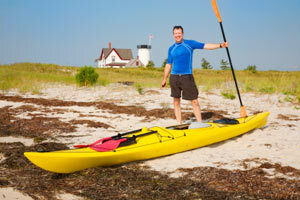 Like many of the other Cape towns, Chatham offers plenty of outdoor activities off the beaches, including hiking, biking, kayaking, golfing, and fishing, among the best in Massachusetts. Likewise, there are a multitude of options for dining and accommodations, making this town on the elbow a great choice for everything you want from a Cape vacation destination.